Though Michelangelo did not think highly of painting and declared that he was not a painter, even going so far as to sign letters, “Michelangelo, the Sculptor,” he painted frescoes which today are considered to be among Western Art's most important and magnificent works. Summoned to Rome by the Pope, Michelangelo reluctantly undertook the gigantic task of painting parts of the Sistine Chapel. Ironically the frescoes that Michelangelo painted in the Sistine Chapel are some of his best works of art; these include the Scenes of Genesis, which are painted across the ceiling of the Sistine Chapel, and The Last Judgment, this fresco is also located in the Sistine Chapel but covers the wall behind the altar. Painting this considerable and awkward space was extremely demanding. A large scaffolding system was built to hold workers and materials. The system was built high up on the walls of the Chapel so that mass could still be held during the work. Michelangelo often bent backwards in order to paint over his head causing him pain and leaving him with lasting physical ailments. Michelangelo was frequently dissatisfied with the abilities of his assistants and fired and hired them on a regular basis. This enormous commission was completed mainly on his own over the course of a four year period. 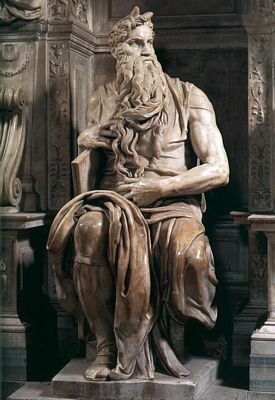 Michelangelo painted with traditional techniques instead of creating new or implementing complex painting techniques. His love of sculpture comes through in his paintings as you view the well-defined bodies in his works. His use of the human form made a great impression on contemporaries and future generations of artists. Regardless of his attitude towards painting, Michelangelo became one of the most influential artists of the High Renaissance period.